Friends of the Arts grant recipient Percy Echols II will be selling glass cups he created March 6 at University Galleries. Friends of the Arts grant recipient Percy Echols II, a senior B.F.A. student, attended a class at the Pilchuck Glass School last summer and brought back a production style that has been incorporated into the studio glass curriculum this semester at Illinois State University. As part of the grant, Echols and fellow undergraduate students will be selling glass cups they created using a mold on Thursday, March 6, from 9 a.m. to 1 p.m. in front of University Galleries in the Center for the Visual Arts. The cups will be on sale for $10 each. 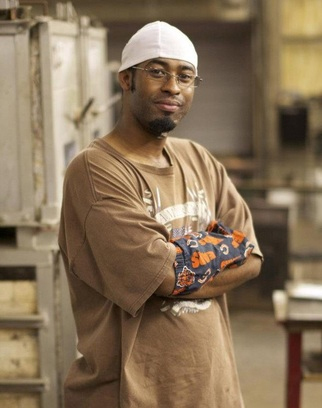 In the following Q-and-A, Echols, of Bloomington-Normal, talked about why he became a glass artist, his learning experiences last summer, and the importance of Friends of the Arts grants. Why did you become a glass artist? I came in wanting to do graphic design. But at the same time as I entered graphic design fundamental courses, I got into glass. It was in a new way of working with a material, and a material that I wasn’t familiar with. There is no exact movement that is very familiar to myself, say ceramics, you got Play-Doh; painting, you played with paints as a kid; drawing, color pencils and all that stuff; but glass uses another tool to manipulate glass, like an extension of yourself. And it is hot; it is dangerous; it is fast. And everything kind of tunes into your mental focus. There are so many things that happen at once. I have done martial arts in the past, and the discipline and concentration really reminded me of that. What did you learn at the Pilchuck School and what did you bring back? The class was called Collaboration: Ideas to Execution. We had two instructors. One is Ben Cobb. He is the lead gaffer (glassblower) at the Tacoma Museum of Glass, and he provided the technical production and craft aspects. And Ann Wahlstrom, who started out glassblowing at Orrefors Glass School in Sweden, and she provided knowledge in design. With them together we get the different ways of making the forms and the traditional elements as well as being able to create design, some sort of aesthetic or an efficiency in application of colors and making forms. In that class, it took this group of students, and we were introduced to the cup mold. And that was the first thing we looked at. It was about applying color in the most efficient way and the quickest way possible. Generally, you could make a cup through offhand working in the glass within five or 10 minutes. But with a mold, you can take a hot, juicy bubble, drop it in there, apply air, and you get the shape that the mold is formed in seconds. So you instantly get that shape; all you would have to worry about is applying the color. Then the second part of that class was the students were to come together and use that knowledge of how they apply color for design. And basically we were divided up into teams by the instructors based on our skills to do certain items, and this was to create a place setting. The students, by themselves, met separate times to think about color, how we are going to apply the color so our different forms would work together, and start discarding useless, or not so efficient design aspects, and then make that happen. Well the momentum from that, since we did a cup sale up there at Pilchuck was to use that money to fund the materials for that place setting and the snacks or beverages that would be served during the exhibition that happened there. Can you describe your work a little bit? Much of my work that I’m doing currently is a lot of sculptural elements. They’re a bit of fantasy, and they’re mostly creatures, or abstractions of archetypes taken from mythology, whether that’s Greek, Roman, African, Japanese, cultural pieces, and use these different elements in my own personal narrative. I pull these images together. I’m taking one moment and dealing with the underworld. A lot of the elements in my story are very dark, but there are cool bits and pieces that you can connect to our current world and current issues. For a lot of students, much of their money is going straight to rent for the apartments and food, and maybe just the textbooks and materials. If they have an idea or something they want to explore, they are often hindered by the aspect of money. Letting them know that there is support—that’s what they’re doing. I have gone to other departments, especially ceramics, and new media, painting, and sculpture to let them know that there are opportunities and there is support that is available to them. If you see someone with a lot of passion, you want to see the exploration happen soon so they can get the most of out their education here.